Parkinson’s Disease and Drenching Night Sweats? Solutions! PatientsLikeMe members with Parkinson’s disease (PD) have talked a lot about excessive sweating (aka hyperhidrosis) and heat intolerance with Parkinson’s disease. It can be a “stinker,” as one blogger who has PD recently shared in Parkinson’s News Today. Can you relate? Read on for more information and some possible adjustments or life hacks that others have tried. 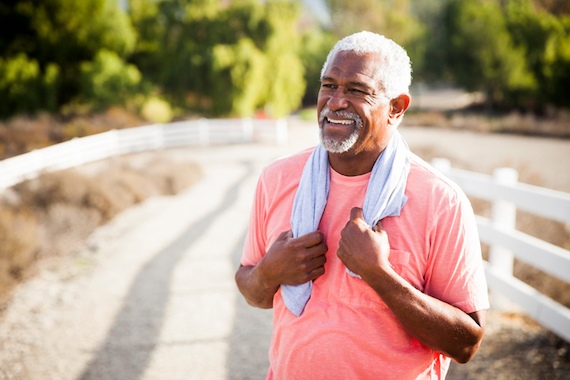 One study found that over 60% of patients with PD experience sweating disturbances like hyperhidrosis (over-secretion of sweat) or hypohydrosis (under-secretion of sweat, which is less common). The Parkinson’s Foundation and Parkinson’s Victoria cover these issues in their guides to skin, scalp and sweat changes related to PD. In addition to hyperhidrosis, many people with PD experience an extra-oily scalp (or other parts of the body), drenching night sweats and general difficulty with temperature control. Some of these problems may stem from PD itself, which affects some of the body’s automatic functions, such as blood pressure and temperature regulation. Research has shown that hyperhidrosis also seems to occur along with “off” times in levodopa treatment and with dyskinesia (jerky movements without tremors). Elsewhere online, people with hyperhidrosis recommend wearing solid dark colors or clothes with prints to help camouflage sweat marks, using underarm sweat pads, wearing leather shoes to help stave off odor, and bringing a small towel and a spare shirt just in case. A New York Magazine writer with hyperhidrosis (but not PD) rounded up his favorite products for over-perspiration. Talk with your doctor about any skin- or sweat-related issues you’re experiencing. Dr. De Leon says that anxiety, thyroid problems or other health conditions can also cause or add to excessive sweating. Join PatientsLikeMe to see what the community says about excessive sweating and heat intolerance with PD, or add a comment below based on your own experiences. I sweat excessively and it is really bothersome. We have spent the past 3 weeks in Florida where the temperature is well into the 90’s and the humidity levels are about the same. The sweat pools on my skin as though I have a hose running water over my body. It is so very annoying. I can’t wait to get back to my cool mountain air next week! I have no solutions. I shower and use deodorant at night. I drink lots of water during the day and use tissues a cloth to sop up the sweat. You’d think I’d sweat off some extra pounds, but, sadly, not. Some people seem to think night sweats, especially for men, a punishment for not having this experience as women do with menopause. I am a woman and I am here to tell you at least from my experience, menopausal sweats were a walk in the park compared to the night sweats I and some males with PK experience. It does not have to be weather hot, it can even be winter cold and all night I will be covers on, covers off and my night gown and sheets are wringing wet with sweat. Just another reason to lose sleep? I don’t think so! Whenever I research this subject what I mostly find is that these night sweats are indeed reality. Having this said the immediate follow-up directs me, the miserable and sweating victim to advertisements for super and wonderful antiperspirants. Again, I don’t think so!